Singer David Byrne has been hanging out in Buenos Aires lately with the band La Portuaria. On his blog Bynre writes about a bike ride around Palermo, making a video with La Portuaria in Chacarita cemetery, rehearsing with the band on the day that Argentina played Mexico in the the World Cup, and a trip to Bariloche. Some interesting stuff! It has been a long time since reading Gravity’s Rainbow and I wasn’t thinking about Borges at the time. But literary blogger Maud Newton points to an article in the Miami Herald that reminds us that Pynchon lifted some lines from El Sur as a tribute to Borges. Now, I need to go back and re-read Gravity’s Rainbow. Pynchon fans should note that there is talk of a new Pynchon book coming out this December. It’s the weekend so it’s time for the tourists to descend upon San Telmo for the antique fair. San Telmo is actually much nicer during the week when it is not so crowded. I’m reminded of something that Borges had said about San Telmo and the southern barrios of Buenos Aires. For everyone in Buenos Aires, the Southside is, in a mysterious way, the secret center of the city. 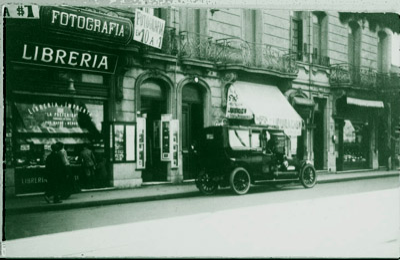 Not the other, somewhat ostentatious center we show to tourists — in those days there was not that bit of public relations called the Barrio de San Telmo. But the Southside has come to be the modest secret center of Buenos Aires. When I think of Buenos Aires, I think of the Buenos Aires I knew as a child: the low houses, the patios, the porches, the cisterns with turtles in them, the grated windows. That Buenos Aires was all of Buenos Aires. Now only the southern section has been preserved. I felt that I had returned to the neighborhood of my elders. I know that some of these words are not quite how it is expressed in Spanish but it will have to do, for now. For instance, “Southside” is likely “el Sur” in the way that Borges wrote when he referred to this area. Almost thirty years after Borges gave that lecture, people still don’t make it to many of the southern barrios other than San Telmo and the ultimate tourist trap that is Caminito in La Boca. Of course, nothing is like it was a hundred years ago. It’s debatable even if it was in 1977 when Borges gave this lecture. Of course, by that time he had been blind for twenty years and, perhaps, was fortunate not to see, literally, the changes. Yet, the southern barrios do have a certain feeling not found in Barrio Norte or Palermo. Las viudas de los jueves won the Premio Clarín de Novela last year by a prize jury that included one of my favorite novelists, José Saramago. The book was selected from a competition that included over 1,300 works, just to give you an idea of the range of books being published. Unfortunately, few of those will ever make it into an English translation, more on that in another posting. Las viudas de los jueves is about a group of families who live in Altos de la Cascada, a fictional gated community in the upper middle-class suburbs of Buenos Aires. Set in the late 1990s the novel portrays that life among those seemingly happy families isn’t so perfect. The novel culminates in a tragic episode that coincides with the rising economic crisis in Argentina and September 11. Paging through the novel I am reminded about the way that the word country club is used around Buenos Aires. Altos de la Cascada is called a Country Club, in English. It is actually a gated community and not quite a country club as that term is known in the U.S., though the two have many similarities. I’ve never been fond of either country clubs or gated communities, so I can’t speak authoritatively on the difference except that members of country clubs don’t usually live at the country club and that gated communities may or may not have golf courses, etc. Both may be exclusive social entities. From reading the real estate section of La Nación on the weekends, it seems that gated communities/country clubs are quite popular among a certain segment of porteños. There was an intersting article a few months ago in Perfil about how Jews are denied membership into many (most? all?) of those communities. Evidently, it only takes one family in a community to veto the application of a new resident. Anyway, if you want to read a good book about middle-class life in Buenos Aires before the economic crisis then Las viudas de los jueves is recommended. This is the last day of my “30 days with Borges” series. It has been fun being absorbed into the world of Borges and writing these posts. (Sorry that some have been very long but I’ve not put any effort into editing). While this is the last day of the series I will continue writing posts about Borges but with less frequency. There are a lot of other great literary aspects of Buenos Aires that I will be covering, in addition to more about Borges. Also, welcome to the new readers of this blog that have come about through these postings. I half expected the readership of this blog to plummet during this series but it has remained steady and even increased slightly. So, a special thanks to loyal readers who have stayed. I like El Sur so much that I chose it as the domain name for my Web site. Actually, a few other things went into that decision but the story title did have a lot to do with it. El Sur is set in February 1939 about a librarian named Juan Dahlmann who has a number of similarities to Borges himself. The story has some of the best descriptions by Borges of Buenos Aires and the pampas. There’s an incident in the story that occurred in the real life of Borges. We are told in the story that Dahlmann had hit his head on a “recently painted casement window that somebody had forgotten to close”. That actually happened to Borges on Christmas Eve 1938. Borges was seriously injured and spent a week lying in bed, delirious with insomnia and hallucinations. One night he lost the ability to speak, was rushed to the hospital for emergency surgery and spent a month near death. After he recovered, Borges entered the greatest period of his writing career. I often wondered what went through his mind during his sickness and how it impacted his later writings. El Sur gives us some hint of that. “The first cool breath of autumn, after the oppression of the summer, was like a natural symbol of his life brought back from fever and the brink of death. The city, at that seven o’clock in the morning, had not lost that look of a ramshackle old house that cities take on at night; the streets were like long porches and corridors, the plazas like interior courtyards. 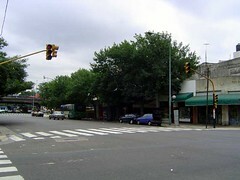 On the way to Constitución Borges mentions something that everyone learns when navigating the streets of Buenos Aires, that the streets change names at Av Rivadavia. But Borges goes on to describe how the southside (el Sur) of the city is different. That is still very true today. “Everyone knows that the South begins on the other side of Avenida Rivadavia. Dahlmann had often said that that was no mere saying, that by crossing Rivadavia one entered an older more stable world. From the cab, he sought among the new buildings the window barred with wrought iron, the door knocker, the arch of a doorway, the long entryway, the almost-secret courtyard. Estación Constitución is a beautiful old train station that is still the railway gateway to points south of the city. Having time before his train leaves, Dahlmann heads over to a cafe on calle Brasil. Borges makes reference to the cafe being a few yards from the house of former president Hipólito Yrigoyen. Yrigoyen was a figure that dominated the Argentine politics in the early part of the 20th century, serving as president from 1916 – 1922 and again from 1928 till a military coup overthrew the government in 1930. Up till the last year of his presidency, which coincided with the worldwide economic depression, Yrigoyen was very popular. Crowds of supporters would gather in front of his house on calle Brasil. Among his most enthusiastic supporters was Jorge Luis Borges. After the coup, Yrigoyen’s house was ransacked by his opponents. Including a brief mention of the house in this story must be an homage from Borges to Yrigoyen. I live on calle Brasil, just a couple of blocks from the spot where Yrigoyen’s house was located. The house was torn down a few years after the coup in order to make way for road construction. Now, as you can see in the photo, a highway overpass runs over calle Brasil on the block where Yrigoyen lived. You would never know anything historic was ever there. That’s Constitución station in the background, which you can hardly see. Side note: The story is set in 1939 but I’m not sure at which point Yrigoyen’s house was torn down. 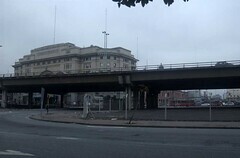 I once read somewhere (that I’ve now misplaced) that it was torn down in the 1930s for the construction of Av 9 de Julio, which means that it would not have been there in 1939. Borges would have known that and possibly included the reference to the house for that very reason. But perhaps it was demolished later when the highway was constructed? Update: I’ve been looking at some aerial photos of this area from the 1940s, the 1960s and 1978. I cannot exactly pinpoint the Yrigoyen house but I have realized that this block was not demolished until the 1970s. “He ordered a cup of coffee, slowly spooned sugar into it, tasted it (a pleasure that had been forbidden him in the clinic), and thought, while he stroked the cat’s black fur, that this contact was illusory, that he and the cat were separated as though by a pane of glass, because man lives in time, in successiveness, while the magical animal lives in the present, in the eternity of the instant. On calle Brasil today one can still find a cafe where a cat lives. In Bar Britannico, on the corner of Brasil and Defensa, look around for the cat that is usually asleep under a table or in one of the chairs. Every time I go in there I think of the cat in El Sur. Update: See my comment #4 below. “Outside the moving shadow of the train stretched out toward the horizon. The elemental earth was not disturbed by settlements or any other signs of humanity. All was vast, but at the same time intimate and somehow secret. In all the immense countryside, there would sometimes be nothing but a bull. The solitude was perfect, if perhaps hostile, and Dahlmann almost suspected that he was traveling not only into the South but into the past. Afuera la móvil sombra del vagón se alargaba hacia el horizonte. No turbaban la tierra elemental ni poblaciones ni otros signos humanos. Todo era vasto, pero al mismo tiempo era íntimo y, de alguna manera, secreto. En el campo desaforado, a veces no había otra cosa que un toro. La soledad era perfecta y tal vez hostil, y Dahlmann pudo sospechar que viajaba al pasado y no sólo al Sur. So far, the story is really a setup for Dahlmann’s adventure in the pampas, which I will leave for you to read. There are the typical features that Borges loved…the country store, knives, and gauchos. In this series I never did really cover the thoughts of Borges on translation and he addressed that topic quite often. Poetry brings up even greater difficulties than prose. Essentially, the objective of translation is not to be literal but to provide the spirit of a work. Ultimately, a translation is a variation on a tale. Borges said something to the effect that you have never really read a book until you have read all of its translations. Now, I need to go and hunt down that exact quotation. with the clarity of tears. Years ago when I first started reading Borges I remember being fascinated with all the streets of Buenos Aires that he mentions in his stories. At the time I never thought I would be living in Buenos Aires. And I never would have imagined that I would be living in a neighborhood that figures so prominently in so many of those stories. When I’m out walking around I often think to myself that Borges himself wandered these very same streets. Before he lost his sight, he must have looked at many of these same buildings. Years from now, after I have long left Buenos Aires for some yet unknown part of the world, I will always remember my barrio through the story of Borges. Yet, not all the streets have retained their character. One of the most important stories by Borges is El Aleph. It tells of a mystical encounter in the cellar of a house on avenida Garay. The location and the story El Aleph also play a prominet role in The Tango Singer by Tomás Eloy Martínez. In a recent New York Times travel article about Borges and Buenos Aires, Larry Rohter starts by telling us about his own experience on this anonymous street. Indeed, he describes Garay accurately as it is now a very bland street, one that would go unnoticed if not for this story by Borges. El Aleph can be a complicated story but well worth exploring. Some familiarity with Dante would be useful but that shouldn’t scare anyone away. Not only is the woman of the story named Beatriz, there’s a character with a very Dantesque sounding last name: Daneri. Borges also brings the Kabbala into the story. While I’ve not mentioned it in this series, Borges had a strong interest in the Kabbala — long before it became fashionable. El Aleph is an essential story for understanding the literature of Borges. “I come now to the ineffable center of my tale; it is here that a writer’s hopelessness begins. Every language is an alphabet of symbols the employment of which assumes a past shared by its interlocutors….Does the Aleph exist, within the heart of a stone? Did I see it when I saw all things, and then forget it? Our minds are permeable to forgetfulness, I myself am distorting and losing, through the tragic erosion of the years, the features of Beatriz. During the big football games I’m accustom to hearing cheers from the streets whenever there is a goal. But when Argentina scored its first goal this morning against Serbia-Montenegro I didn’t expect to hear the church bells ringing from Santa Catalina outside the street from my apartment. Considering that Argentina scored 5 more goals, it amounted to a lot of ringing. I’m not complaining. It’s just another part of the World Cup experience in Buenos Aires. 29 mins – Argentina 2 – 0 Serbia and Montenegro: How the f**k am I supposed to describe that? The goal of the tournament so far and quite possibly the greatest goal I’ve ever seen. 31 mins: Ping. Ping. Ping. Ping. Ping. Ping. Ping. Ping. Ping. Ping. Ping. Ping. Ping. Ping. Ping. Ping. Ping. Ping. Ping. Ping. Ping. Ping. Ping. Back-heel from Crespo. Cambiasso … goal! With 24 short, high speed passes, the blurry shapes that are assorted Argentina players carve open Serbia and Montengro, before Cambiasso pulls the trigger from the edge of the penalty area. The Serbia and Montenegro players were left standing like statues they were so mesmerised. Make it your business to see that goal – it was unbelievably good.